A couple of Frugal Fridays ago, I shared an art project for Mr. One's Tween room, and told you all it was being printed. Well, I got it in the mail on Friday (from my fabulous Father-In-Law - the art professor extraordinaire who printed it for me!) It looks even better in person. Now, because it is a custom size, and my budget for the tween room is gone, I couldn't have it custom framed. So, I went and bought one of those standard sized cheapy poster frames. I was worried that it might look...well....cheap...but once I got the print mounted on foam core and framed up, it actually looks great! I put it above the dresser/bedside table. Which now begs a question of you, my dear readers. I need to redo this dresser and I want your expert opinions...should I just give it a fresh coat of white paint...paint it with chalkboard paint...or give it a coat of dove gray? What say you? Please weigh-in in the comments and let me know what you think. I also gave the lamp a little pick-me-up by switching out it's gold shade for a simple white one. It looks more modern, and lighter. So I think it will be staying for now. Hmmm, looks great! I think the grey would be great - or whatever color the bed frame is, except that may be too matchy. Looks good, love the print! My opinion? Grey. It. Up. Go for it. If you don't like it you can always go back to white but my motto is "Go bold or go home!" :) Speaking of going bold... what about a real mustardy yellow for the dresser? Best of luck! I agree Grey! Not chalkboard for a tween it may be to juvenile. I also agree that Grey is the color it should be! i definitely think dove gray for the dresser! it will tie in with the bedding & also give a nice "more mature" feel to the dresser. What about a charcoal color? That's grey and black to coordinate with the bed? Also, maybe add a strip of color to the lampshade? I love color and with neutrals, a shot of color would look great just on the lampshade. I love the print. You are my first blog of the day every day! I personally think the grey is a great idea but ask your son... Our 14 yr old has just asked me to do a chalkboard paint and white board treatment in his room (go figure) but then he is rather artsy and likes to draw... Plus he wants something large he can use for composing as well drawing floor plans (artist/musician/architecture type kid)! You never know he might really surprise you!! I agree with Lise about the charcoal, otherwise I would go with gray. I love the idea of changing up the dresser! The gray is a great idea, or maybe for something really fun and unexpected, pick one of the colors from the pop-art? Also, I'd add some wrought iron or ORB cup pulls. LOVE how the pop-art turned out. 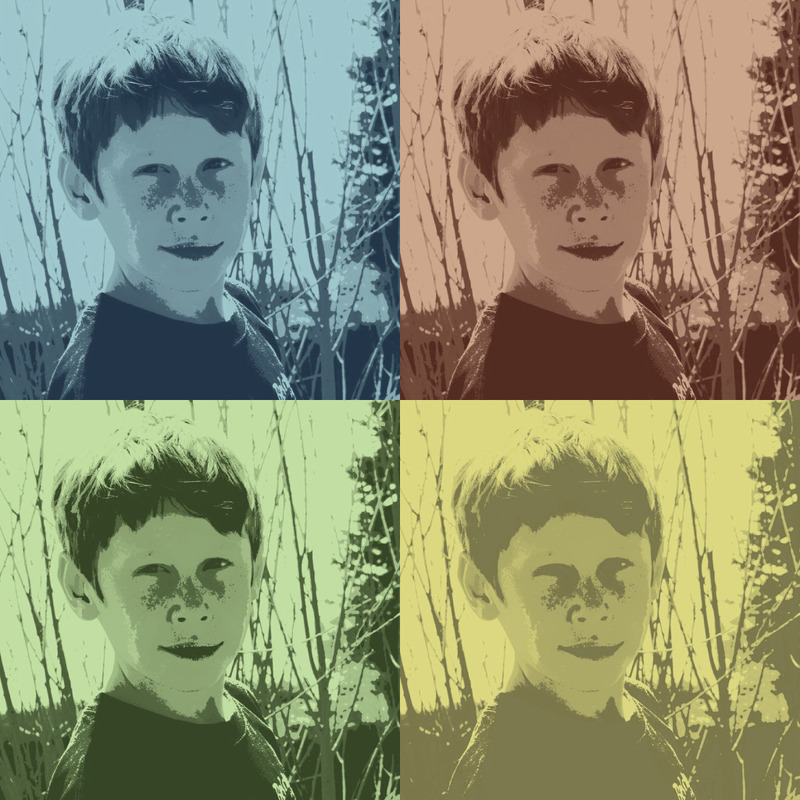 I did a cowboy pop-art print for my boys room that I'm thinking of blogging about soon. I vote for grey as well. Or paint the body white and the drawers grey - that's a look I've been loving as I've seen it, but haven't taken to the time to do it in my house! Definitely gray for a boy's room! I would paint the top of the dresser black and the bottom white. Or sand down the top and bring it back to the natural wood which I would stain a deep chestnut. If you did go gray I would do a very soft gray...and again the top black. JMHO..whatever you decide it will look great! i am loving white these days but it seems to lack a little something in that corner. i love the grey idea, but maybe a touch lighter than the bedspread so it's not so matchy and dark in that corner. plus i think the frame and lamp especially will stand out more if it's a bit lighter. I vote for dove grey as well. Would look classic and grown up! I would go with Sue and stick with a white or light gray and black top. Since it is a basement bedroom you don't want to make everything too dark.